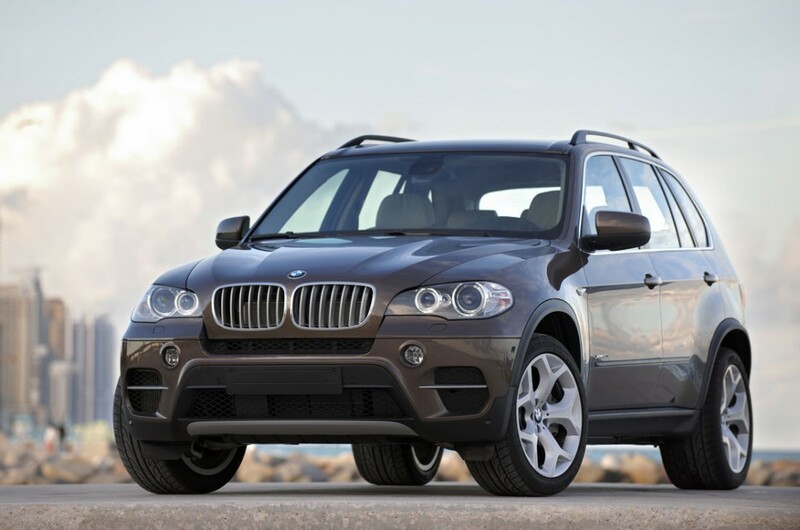 The BMW X5 has prestige, luxury, excellent build quality and superb handling for such a large car and when you add the family pack to your list of options for this vehicle you can now have this car as a seven seater. This is a real drivers car with a range of powerful engines and is equally at home on country roads as the motorway. A word of warning though…if you are looking to regularly carry six passengers you may want to look elsewhere as the space in the the boot is cramped. 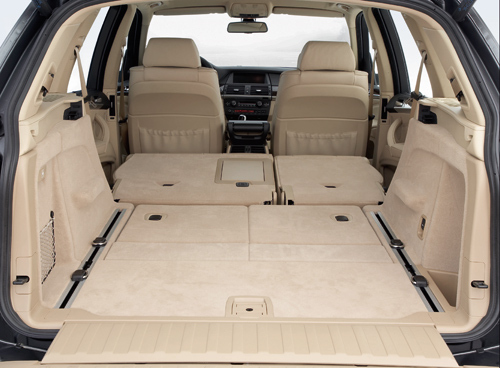 The BMW X5 has plenty of space for passengers and luggage in five seat mode but if you are looking to use all seven seats all the time you may be disappointed. The two seats in the boot are really only suitable for use by children or for very short journeys by adults and when in use leave little boot space behind. The middle seat in the rear while not a full size seat it is a decent size and the flat floor makes it perfectly comfortable on long journeys. However it makes it difficult to fit three car seats side by side. The boot opens in two sections making it easy to load items but unlike some cars like the S-Max means that the shopping doesn’t slide out when parked on a hill. The BMW X5 achieved all 5 stars on the Euro NCAP test. There are the usual complement of airbags for front and middle seat passengers. Though as seems common amongst most seven seaters the airbags do not extend to the third row passengers. There are also a whole host of active safety features on the X5 including Anti-lock brakes, cornering brake control, traction control and run-flat tyres with warning sensors. BMW offers some excellent engines to power the X5. Engines that provide enough performance to make you almost forget that you are driving an SUV. You have a choice of four engines. A 5 litre petrol engine that most people would not even consider given that it returns just 22 mpg and three diesel engines: three, four, and five litre variants. The most popular engine to choose with the X5 is the 30D which is not surprising when you consider it gives a 0-60 time of 7.6 seconds, a top speed of 130mph and combined miles per gallon of just 38.2. The X5 30d SE with this engine is also the cheapest of the range with an on the road price of £45,070. The X5 driver is blessed with a simply beautiful driving position. Everything can be tuned to each drivers individual requirements and the quality of materials is superb. Sitting high up you have a commanding view of the road ahead and the tight suspension means that you can push this big car through corners as if it were almost a sports car. 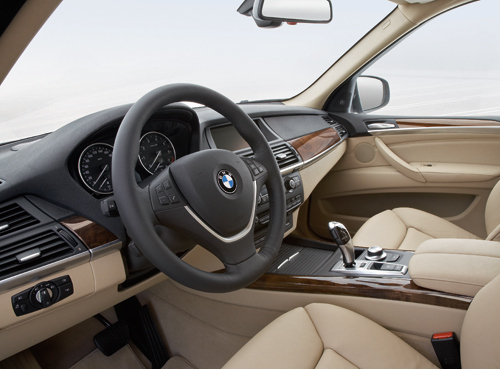 This is a luxury car and both driver and passengers will enjoy travelling in the X5. Very little road noise encroaches into the cabin. The seats are extremely comfortable and give plenty of space…..in five seat configuration. The extra two seats in the back do not have enough leg room to make it comfortable for anyone other than children or for short journeys for adults. The ride is also firm compared to some other luxury SUVs like the Range Rover. The first model X5 had some issues with reliability. However this newer model seems to fare better and whilst not up to Japanese manufacturers levels owners generally are happy with the reliability of the X5. This is an expensive car to buy and there’s no getting away from the fact that this is not going to be a cheap car to run. However if you go for the most popular 3.0D engine you may be surprised that some aspects of ownership are not as expensive as you might expect for this type of car. The 38 mpg is very reasonable for the size of car and the performance you get and at 195g/km it manages to sit in road tax band J which means a first year road tax of £460 and then £250 per year. This model would be insurance group 42 out of 50. If you are looking for a luxury seven seater then the X5 will be on your shortlist assuming you only plan to use all seven seats occasionally. It is one of the best seven seaters for driving and handling and is a lovely car to travel in. However if you are looking to use all seven seats regularly then I would strongly suggest you look at alternatives in the luxury SUV sector.